Leviton 1-Circuit keyless incandescent lampholder with medium base, fits 3-1/4 or 4-Inch outlet box. 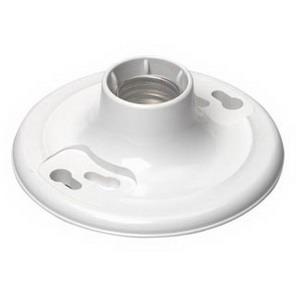 This twist-lock mountable lampholder in white color, features urea body and aluminum socket shell. It is compatible with bulb having power rating of 660-Watts and voltage rating of 600-Volts. This 1-Piece lampholder features two terminal screws and top-wired connection. Lampholder is UL listed and CSA certified.